For the 3rd time this year, FRIDAY THE THIRTEENTH falls on a Facebook Fridays! 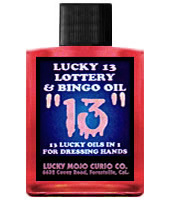 -- and the Lucky Mojo Curio Company is holding a random drawing to give away 13 different Lucky 13 spiritual supplies, so today could just be your Lucky 13 Day! 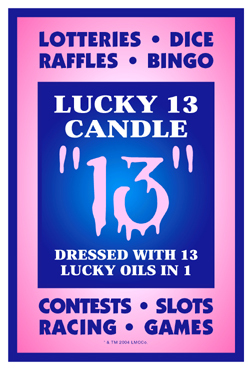 This week the prizes are 2 Lucky 13 Vigil Candles, 2 bottles of Lucky 13 Lottery and Bingo Oil, 3 foil packs of Lucky 13 Bath Crystals, 3 foil packs of Lucky 13 Incense Powders, and 3 foil packs of Lucky 13 Sachet Powders, all hand-made to bring reverse bad luck into your service! We have a winner! In fact, we have 13 lucky winners! Our Facebook Fridays! winners for November 13, 2015 are: Jackie Yacono, Leeanne McHugh, Emily Robinson, Phillip Nerestan, Emily Wagner, Teri Moody, Jessica Leigh Carroll, Michaelle Senecharles, Pamela Hester, Sonia Sanchez, Anita Powell, Patrice Butler, and Sharae Reed.